Summer is just around the corner! Although we’re fortunate to have great weather almost year around, it’s just something about ‘summer’ that makes me think of long days at the beach, a dip in the pool, and sitting out back with my kids in the afternoon with a refreshing cold drink or frozen treat in hand. Popsicles, fresh lemonade, ice cream, smoothies, shakes, and now this…my Tropical Creamy Soft Serve! If you haven’t already figured it out, I’m a huge fan of my Vitamix. It’s easy to use, works great, and is easy to clean… my type of kitchen equipment. I use it the most to make our green smoothies and quick frozen treats. Although I have an ice cream maker, I’ve only used it a handful of times. And even though I’ve been meaning to experiment more with my ice cream maker, I haven’t gotten around to it. Especially since the recent frozen desserts I’ve been making in my Vitamix have been quick and delicious! I developed this soft serve recipe awhile back, soon after we came back from our trip to Hawaii. I was craving those tropical flavors and had bought two large pineapples to enjoy at home. My mom had just brought us a huge box of her home-grown oranges as well. And since I typically always try to freeze some of my fresh fruit for use later on in smoothies or frozen desserts, I had a few bags of freshly frozen oranges and pineapples in my freezer, ready to use. In addition to using bananas for creaminess, I decided to add in some coconut cream. Out came this delicious creamy soft serve! It was perfect! Since my kids couldn’t wait to get their hands on some, I had to photograph quickly before it was all devoured. Although you can store this soft serve in the freezer to enjoy at a later time, for best results, I highly recommend enjoying it immediately after it’s made. Be on the lookout for a great roundup of some of my favorite summer-time frozen treats coming to the blog soon! On a more personal note, my Dad would’ve been 68 today. I miss him dearly. I’ve shared a few of my personal thoughts below. These past 2 months, and this upcoming month have been and will continue to be very emotional for me. Starting with the Annual Donate for Life Walk in SoCal last month, which we’ve been attending since it first started, my Dad’s birthday today (May 28th), Fathers’ Day in June, and June 23rd which will mark ONE year since the day my Dad passed away. Emotions start to rise, anger starts to kick in, and later, just when I feel I’m back at an acceptable level of peace with everything, another day comes to remind me of all the pain and events leading up to my dad’s last day. They’re already very vivid memories that are constantly on my mind, and now as those days come closer, I remember even more so every single event, the conversations, feelings, pain and suffering, phone calls, and all the tears that were shed. Despite all these thoughts, I’ve also come to realize even more so this past year, that as much as you can’t help but feel sadness and anger for lost loved ones, I am very grateful for the life we have had so far, and the wonderful happy memories of my Dad that will always be with me. These thoughts constantly remind me to try and LIVE in the moment, LOVE and cherish those around you, and LAUGH as much as you can because LIFE is short. This blender-ready, no-churn, re-fined sugar free soft serve will take you back to your favorite tropical location! It's perfect for a quick and easy treat! Remove the frozen pineapples, oranges, and bananas from the freezer. Let them sit at room temperature for about 5 minutes. Place the pineapples, oranges, and bananas in a powerful blender, such as a VItamix. Remove the can of coconut milk from the fridge without shaking it. Slowly turn it upside down, and then open the can. You will see the liquid coconut milk (the part that did not solidify) will now be at the top of the can. Slowly pour out this liquid into a bowl or cup. 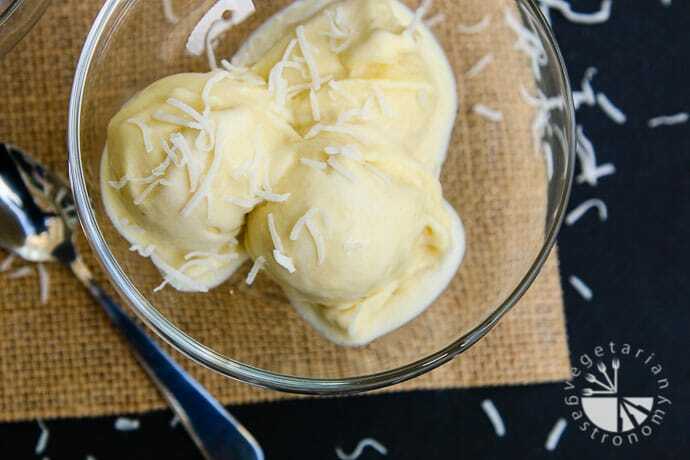 Scoop out this coconut cream into the Vitamix along with the frozen fruit set aside earlier. Blend on frozen dessert setting, and use a Tamper to push the ingredients down into the blender and blend into a frozen dessert. If needed, use a minimal amount of the saved coconut water to start the blending process. Immediately scoop the soft serve out of the Vitamix into serving bowls. 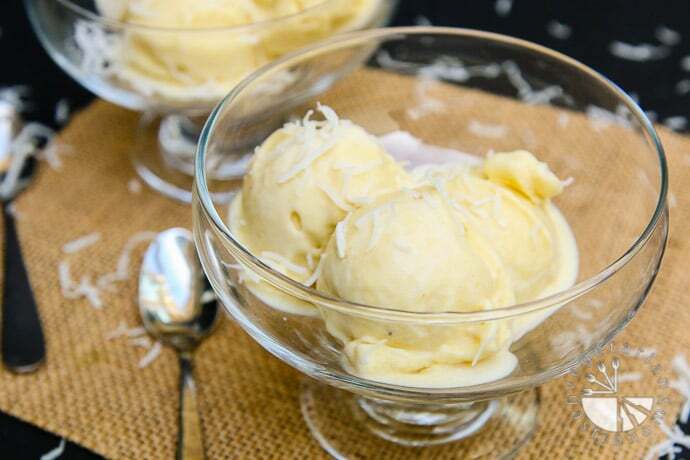 Top with some shredded coconut and enjoy immediately! To Serve - This soft serve is best when served immediately after making in the Vitamix. 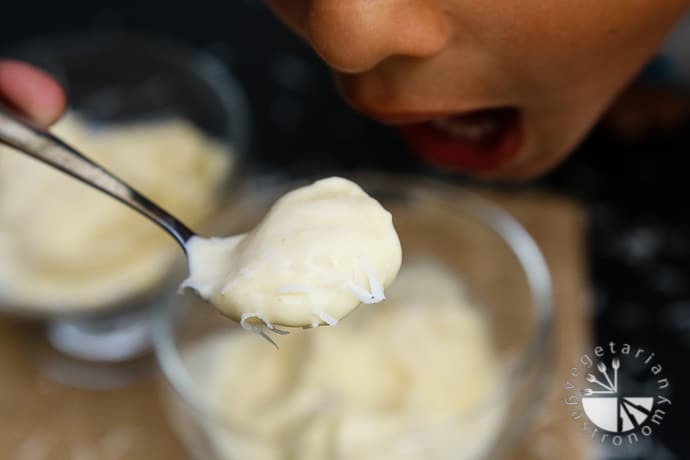 Bananas - The amount of frozen bananas used in this recipe depends on your preferred level of sweetness. Will this work with a lower fat coconut milk? I'm on a low-fat, plant-based eating regimen. 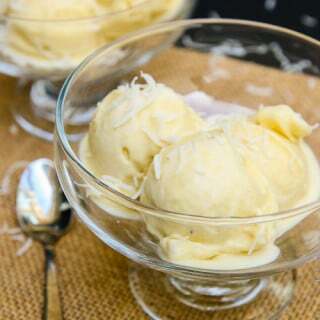 The coconut cream is thick, whereas the coconut milk is more liquidy, so the soft serve will be thinner in consistency. It will still taste great, but more like a thick shake. I would recommend either using the lite coconut milk and enjoying this as a thick shake, or simply leaving the coconut milk out and perhaps adding an extra 1/2 to 1 frozen banana to make it creamier if you are fine with the extra banana flavor, although the coconut flavor in this is delicious. Hope that helps! Either way I think it'll taste great still...let me know what you end up trying! Miam! Love anything with coconut milk. 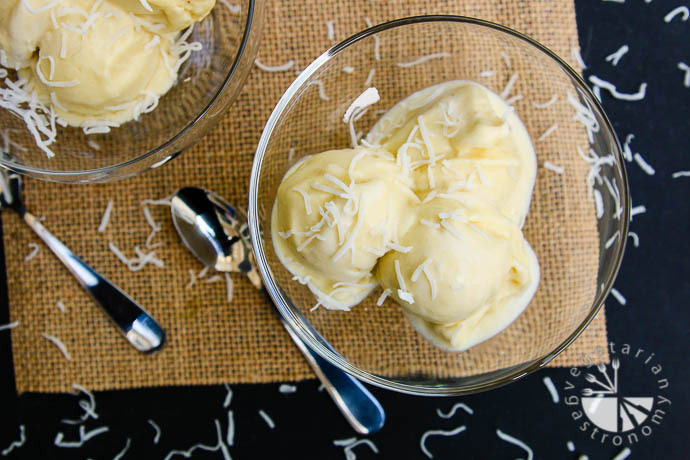 Pineapple and coconut milk are the best dessert combination! Me too!! I always have coconut milk in my pantry and at least one can of coconut milk or coconut cream in my fridge =) Love all the tropical flavors...thank you Rika! Would this work without the banana? I am not supposed to eat those. Could I add mango instead? 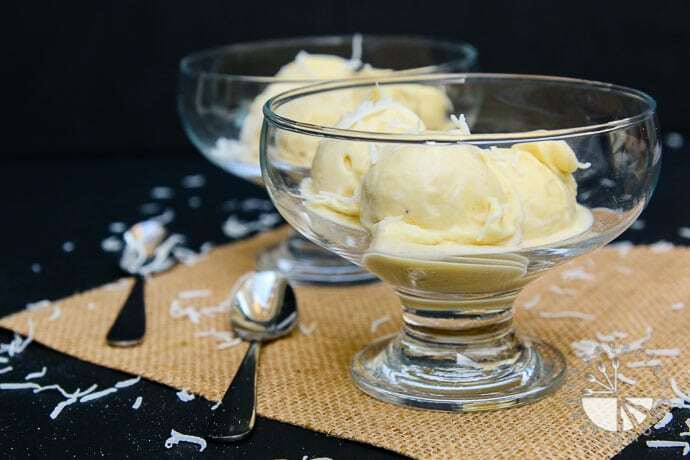 For this recipe, the banana provides not only natural sweetness, but also acts as the creamy agent in addition to the coconut cream for making this into more of a soft-serve type texture. You can definitely do it without the banana, but you may need to experiment a bit. Perhaps add some maple syrup or dates for some sweetness, up the amount of oranges and pineapples, and add some more coconut cream for added creaminess. The flavor and texture will be completely different, but it should still taste good! You can even throw some frozen berries into the mix! I'd love to know what you do if you give it a try! This recipe looks and sounds fantastic! I bought my Vitamix a few days ago and would like to try this recipe for my first Vitamix frozen dessert. I want to serve 4 to 6 people though. Can the recipe be doubled in a 64 oz. Vitamin container? Yes you should be able to...just make sure to use the tamper! Not a dumb question at all! 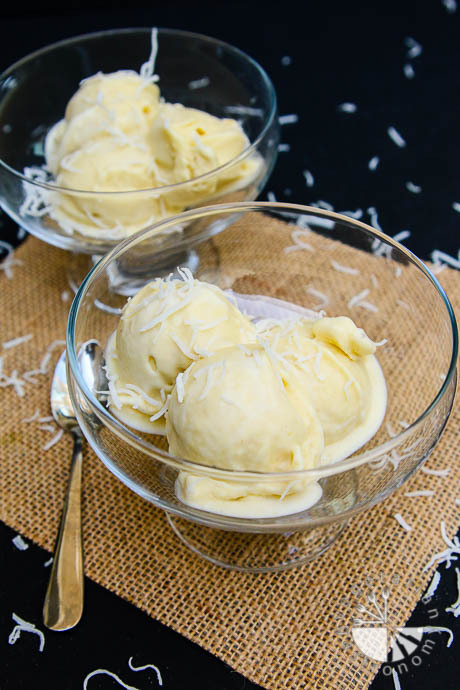 :) Basically you want the thicker coconut cream section of the can of coconut milk for this recipe. In other words, when the full-fat coconut milk is placed in the fridge, it should separate out into thick coconut cream and coconut water. 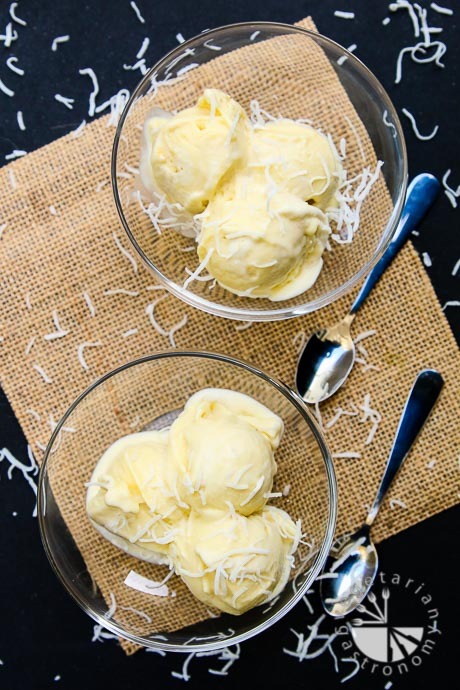 You want to scoop out the thick coconut cream for this recipe. You can even slowly pour the water out and scoop out the thick cream! Hope that helps. Let me know!